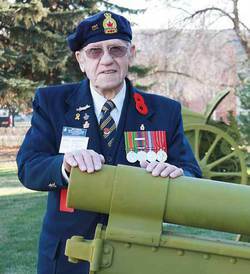 Dec. 12, 2013 4:00 p.m.
Wetaskiwin – “On behalf of the Royal Canadian Legion Branch 86, I wish to make the following public announcement regarding the 2013 Poppy Fund, within the City of Wetaskiwin and the surrounding area”, declared Roy Foster, Past Chair Education and Publicity, Legion Branch 86 Poppy Fund. The 2013 Poppy campaign was led by Syl Gavereau. Mr. Foster’s primary role was to ensure the citizens of Wetaskiwin and surrounding areas were made aware of how money in the Public Fund was used to benefit organizations in the community. “The collection of funds at the 2013 Remembrance Ceremony at the Drill Hall was $3612.54. This total amount of public funds was donated by the Legion to the Wetaskiwin Salvation Army Food Bank ($1806.27) and the Veterans Voices of Canada ($1806.27).” Each year a collection is taken at the annual Remembrance Day Ceremony with the understanding that the money collected will be designated to a worthwhile cause in the community. The total amount collected from the sale of poppies, wreath sales and cash donations in 2013 added up to $17138.36. Mr. Foster explains how the organizations are chosen to receive a donation from the funds collected at the Remembrance Day Ceremony collection, “Each year prior to the November 11th Ceremony, the Executive Committee of Branch 86 decides who will receive the total amount of the contributions offered during the Ceremony collection. Normally there are several organizations that deserve recognition for good work, and financial need. This year the Salvation Army Food Bank and the Veterans Voices of Canada were selected.